A battered woman escapes with her daughter from their abusive home life. The husband left behind isn’t the only danger in this violent world as these women about to find out. The road to safety is paved over the bodies of brutalized women. Stranded in the dark wilderness a killer awaits them but something far more deadly lives in these woods. 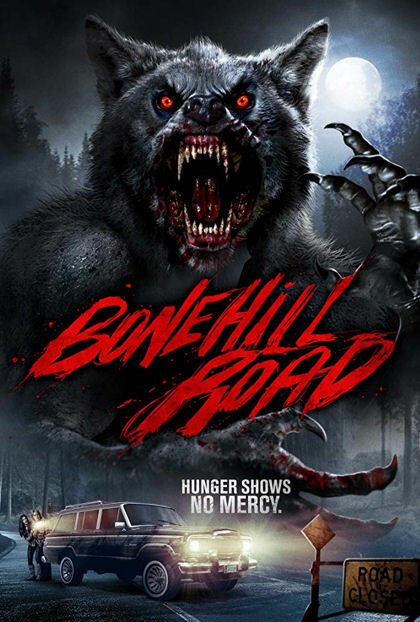 Three levels of terror await down Bonehill Road, domestic, serial and monster. There is no redemption with a worse fate waiting around every curve. Writer, director Todd Sheets is an experienced filmmaker used to working without a budget which is exactly what Bonehill Road is. Made for less than an annual minimum wage salary and with practical effects, a layered story of terrors is executed they best they could on the budget. Budgeting filmmaking hurts the films sound, lighting and cinematography making it look like an amateur feature. Lead actress Ana Rojas-Plumberg and a cameo role for scream Queen Linnea Quigley are the only two performances that resemble realism. The rest of the cast is over-the-top bordering schlock in a film that doesn’t quite venture into comedy. I do love that there is no redemption in the film as these battered women meet worse and worse fates. Filmmaking basics really need to be there though, or your feature must transform like the werewolf into another level of entertainment.